We've been doing this long enough to know. Every cycling trip has its good days and bad. Moments of pure joy and periods of frustration. Pleasant weather and drenching rain. If I could design a near-perfect day of cycling, Day 1 of our Liberation Tour would come really close. It contained all the essential elements for great cycling. A good a send-off. 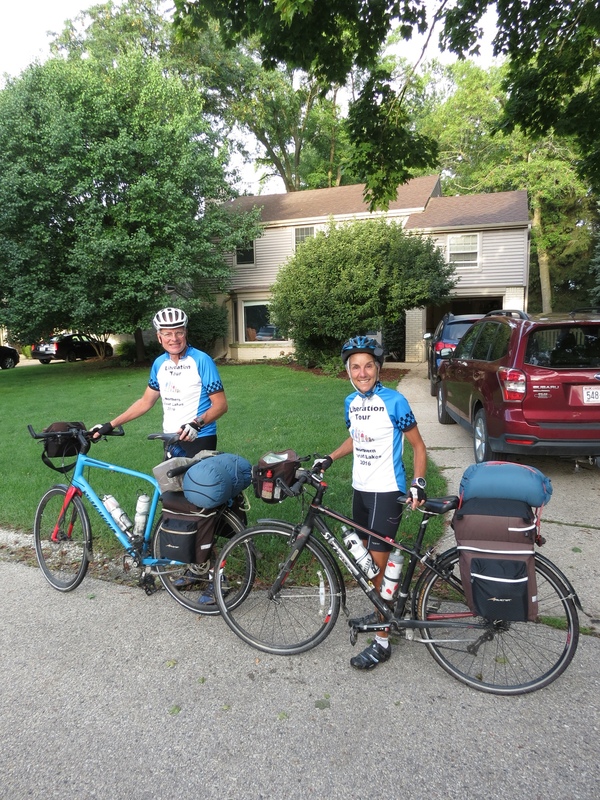 Having nourished us with a hearty steak dinner and homemade morning scones, our son Carl and his wife Chelsea cheered us on as we cycled away from their Milwaukee home. Sun shining, cool breezes and at least 1200 miles in front of us, life on a bike felt great. Safe riding. Exiting a major city can be a hassle to say the least. Not so this time. 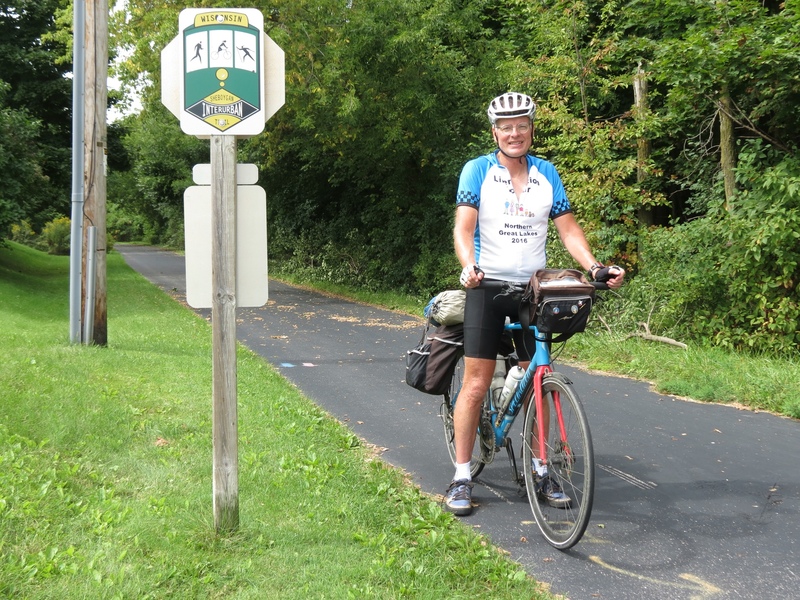 The Oak Leaf Trail eliminated all traffic and congestion as we pedaled through leafy green park-like environs. The smooth pavement and dedicated corridor gave us a speedy and protected ride out of town. Cycling Trail. 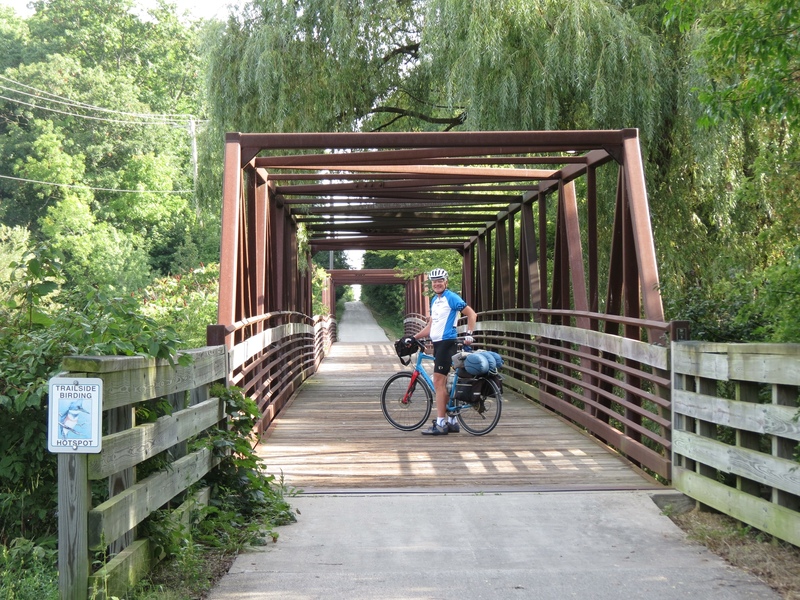 Somewhere along the way, that trail merged seamlessly into the Interurban Trail and our bike route continued, covering 37 of our 58 miles for the day. Unlike some trails this one ran straight through towns, making it more interesting than purely cycling through the woods. Somehow, the areas it skirted seemed to be more affluent and well kept than most. Pristine farms with freshly painted barns. Tidy pastures with longhorn cattle. Upscale townhomes with beautifully landscaped yards. Even the wildflowers were brilliant and well behaved. The trail was flanked by a railway on one side and massive utility poles on the other. But we had no complaints – for that very reason it was flat, easy cycling. Scenic Views. 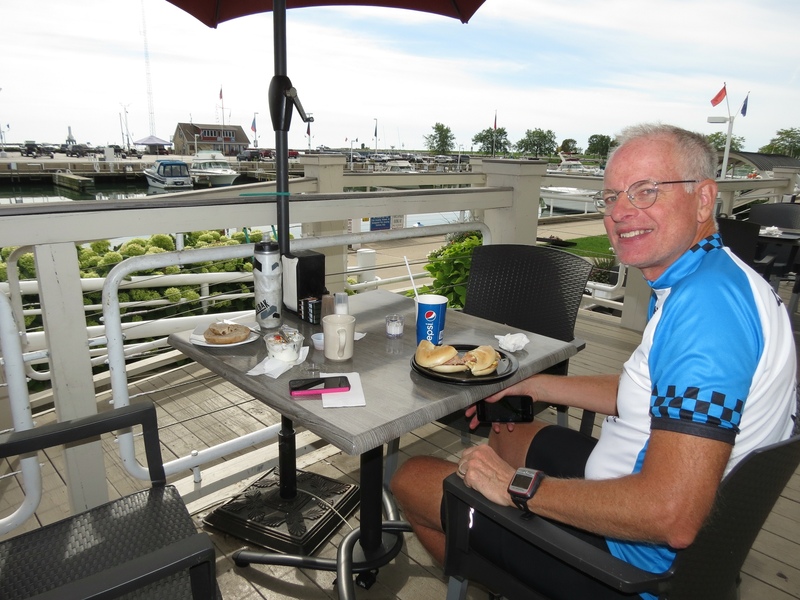 A local cyclist in Port Washington pointed us to the Dockside Deli for our mid-morning breakfast break. Sitting outdoors under an umbrella in the mild morning temperatures while looking out over the marina with Lake Michigan beyond was nirvana. Finding healthy food choices was an added benefit. Lingering came naturally. Leisurely sightseeing. With the miles quickly gliding by, we felt in no hurry. 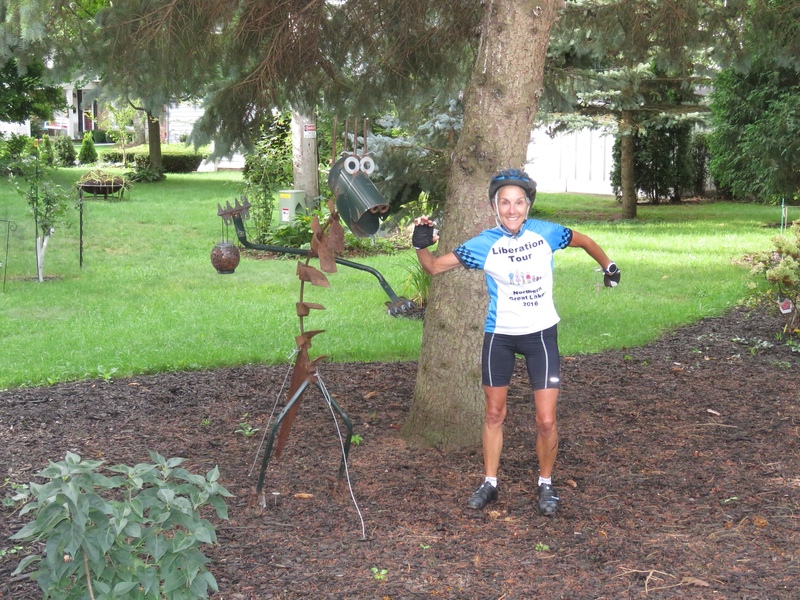 Posing with a lawn ornament (Is this a “Purple Cow?”). 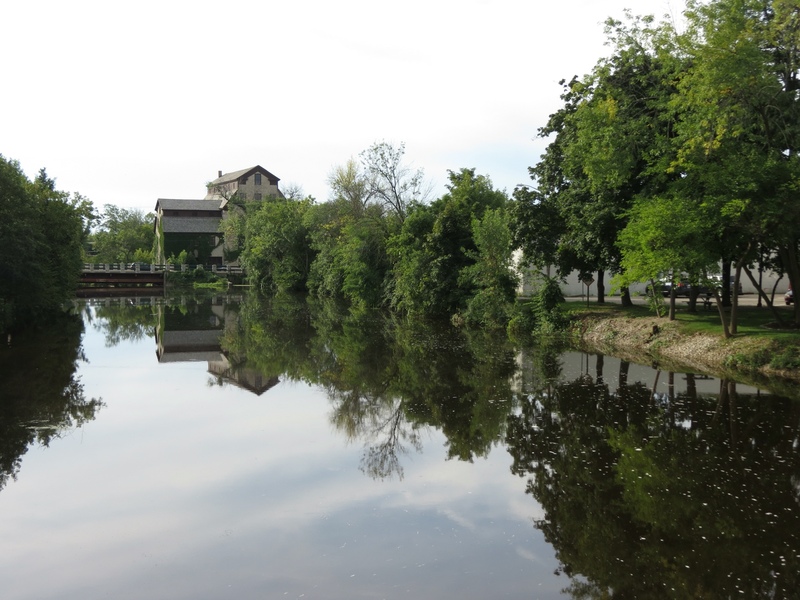 Taking in the view of the river from the bridge in Cedarburg. Checking out the river park in Sheboygan Falls. Stopping to eat an apple at the Gibbsville Orchard. Plenty of time for all that. Delightful weather. The cool morning gave way to sunny warmth. The wind was very light and always behind us. We detected a touch of humidity and admittedly it was reaching hot by the time we finished. But who can argue with warm and dry? We are wise enough to know this can't last. So we savor the experience and know that today cycle touring was easy. We shall see what 4 weeks of tomorrows will bring. This entry was posted in Keeping Fit, Travel and tagged Cycling, Cycling Trip, Liberation Cycling Tour by Molly. Bookmark the permalink.